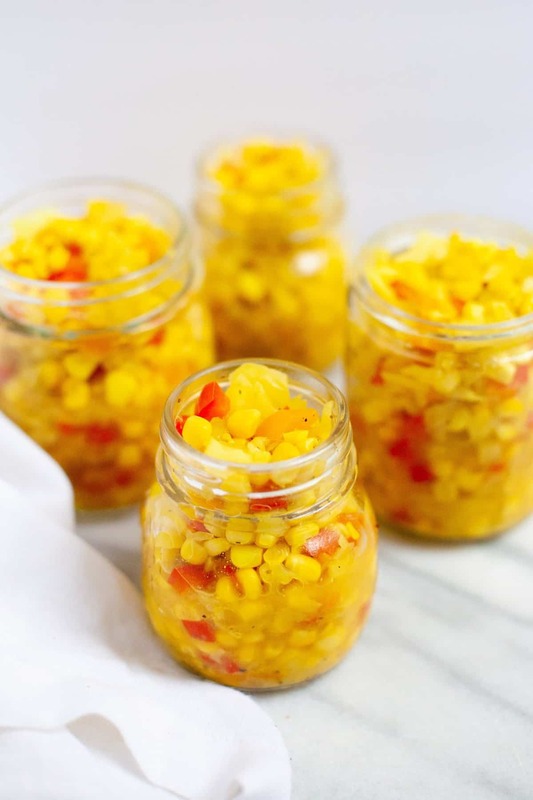 Preserve the taste of summer with this delicious and versatile corn relish! It’s a perfect canning recipe for beginners. Indiana is pretty well-known for its corn, and for good reason! Our hot and humid summers tend to produce the perfect conditions for sweet, juicy, delicious corn. During the summer as a kid, I had a daily ritual of going down to the garden and popping off a fresh ear of corn, shucking it, and eating it right there in the garden. Corn here grows sweet, juicy, and plump enough to eat raw! Once I’ve had my fill of raw corn, boiled corn, grilled corn, and corn ice cream, I start thinking about ways to preserve corn to eat all year long. Freezing is one of the best ways to keep corn fresh-tasting and ready-to-eat at anytime, but one of my other favorite ways to use up a surplus of corn is to can some corn relish. Corn relish is an amazingly versatile dish. You can use it in place of regular cucumber relish on hamburgers, hot dogs, and brats, but it also works as a salsa, mixed in with pasta, or just as a side dish on its own. The thing I love the most about corn relish though is how stupendously easy it is. Especially for first-time canners. It’s a great small-batch dish to get down the basics of canning. I know a lot of folks start with jams and jellies, but I think more savory dishes (like this relish or pickles) are a better way to start. No worries about additives or sugar levels. Just cook it, can it, and process it! Easy. Peasy. If you are afraid of canning, I promise you have no reason to be! Canning is actually remarkably simple and incredibly rewarding. Trust me, the most satisfying sound in the world is the sound of a jar popping to seal after processing. You will feel so proud of yourself! And you get to eat delicious healthy food all year round. To get the kernels off the corn cob, simply place a small bowl upside down in a larger bowl. Shuck the corn and then rest the corn on the small bowl. Run your knife along the corn cob and let the kernels fall into the big bowl. You can also just use a Bundt pan in the same way (but I don’t have one!). See photos of this process in this post. Have all of your canning supplies—jars, lids, funnel, ladle, jar basket, jar lifter tong things, etc.—washed, clean, and ready to go before you start cooking. Before you twist the lids on the jars, run a damp washcloth along the top to remove any relish. That’ll help the cans seal properly. Alrighty, now onto the recipe. Happy corn season. Enjoy! Wash and sterilize jars, rings, lids and all utensils. Prepare a water bath canner by filling a large pot with water and bringing it to a simmer. 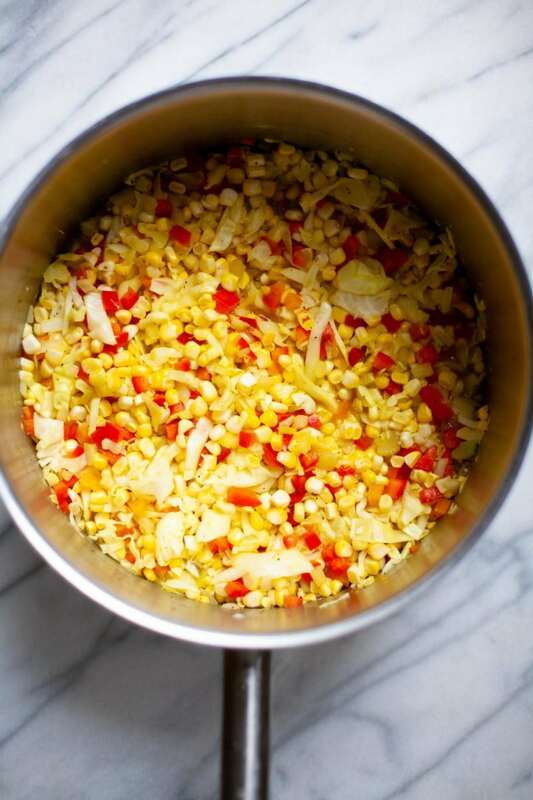 To make the corn relish, combine all ingredients in a large stock pot. Bring to a boil, reduce the heat, and simmer for 20 minutes. Ladle the hot relish into sterilized half-pint jars. Wipe the tops of the jars using a clean towel. Put on the lids and rings and tighten by hand. Process the jars in the prepared water bath for 20 minutes. 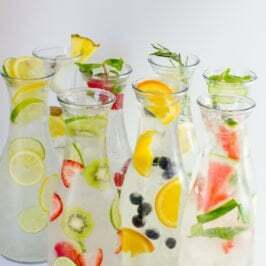 Remove the jars from the bath and let them cool at room temperature. As the jars cool, check the seals by pressing down on top of the lids. If they still “pop,” they are not preserved and need to be refrigerated and used within the next few days. If they don’t move, they can be labeled and stored in a cool, dark pantry. 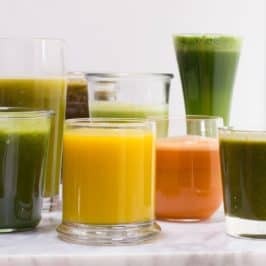 I have been dying to get a set of jars because I love making smoothies and juices in them! But I would definitely preserve some kimchi in them. Thanks so much for this opportunity! my fiance and i go berry picking every summer – so berry dishes is what i would most love to preserve! I would do my grandmother’s pickled carrots as well as her strawberry jam! I think I would stick to jams. The idea of canning still makes me uneasy. That’s why I use my ball jars for drinking sweet tea. How funny that you posted this recipe, because tomorrow my cousin and I are getting together tomorrow for a marathon canning day and one of things we are making is corn relish! If I had time still this summer, I’d use the cans for making Dilly Beans. Thanks for hosting such a fun giveaway! 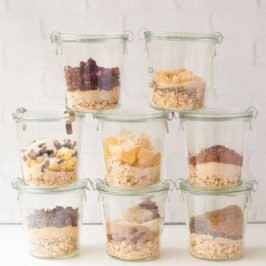 Like a previous commenter said, I love glass jars for bringing my breakfast smoothies with me to work (and I’m also dying to try “salad parfait” but I have no jars the right size), but if I were to start canning, I think I would really want to make some jam. I know it’s cliche, but I really want to try making jam, especially since I find storebought jam too sweet. Though this recipe looks good too! I’d preserve some blackberry jam!! Every year I tell myself I need to learn to can, and every year I get intimidated. THIS year I am going to start. 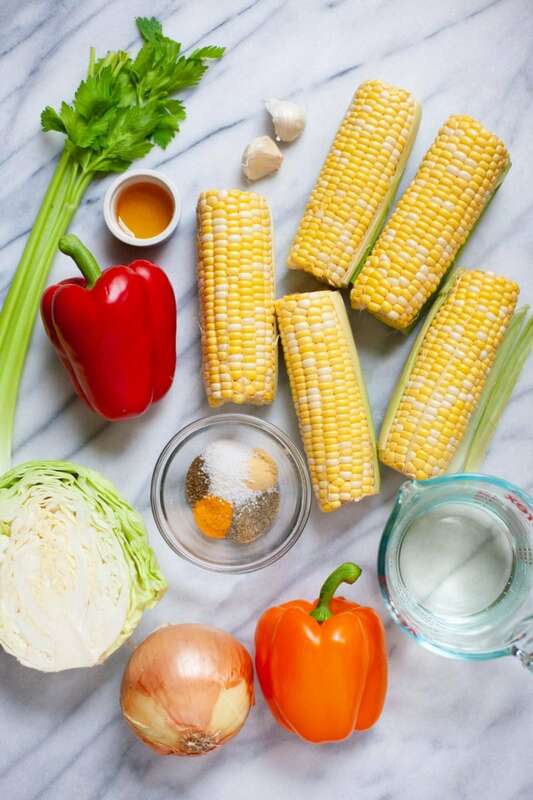 We have great sweet corn here and I am going to make this recipe! 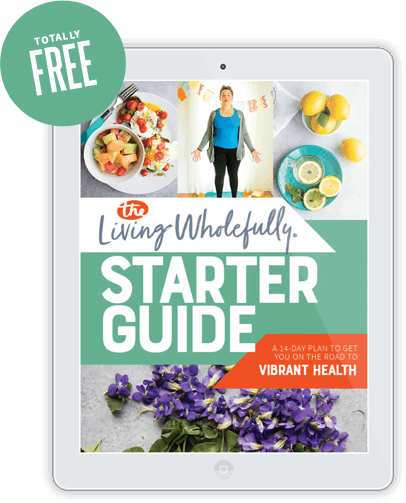 Thanks for the inspiration, the recipe and the giveaway! Hmmm…I think I’d use these for green beans. We usually put up over 100 quarts for our family of 7 for the year. This year…we live in Indiana…it’s so dry that I’m not sure we’re going to have very many. So maybe I’ll use them for spaghetti sauce! I would use these jars to can my family’s homemade salsa! I have to start canning! My mother always makes the best strawberry jam and cans it and sends it our way once she’s made a large batch. I would love to get my hands on her recipe and finally can some of my own! I would can salsa, and pickled ANYTHING! I have never canned before, and I think it’s high time I learned! Salsa! My hubby can never find a salsa hot enough for him (that isn’t habanero), so I’d like to make my own for him. I think I would can some jalapeno jelly. The kind at the store is always too mild for my husband’s and friends’ tastes. It’d be great to give at Christmas time. I also wanted to give a tip about cutting corn off the husk. When you start cutting at the top of the standing up ear, you should be at the base of your knife and then you slice through by pulling down and back. So, when you are at the bottom of the ear, you should be near the tip of your knife. This works much better (and safer) then trying to push straight down. I’d definitely make some quince preserves. So delicious! I would can appleasauce and apple pie mix. I have never canned and have always wanted to! I think since I have jelly on my English muffin EVERY morning I would start with a jelly or jam (even though you make the savory look so good!). 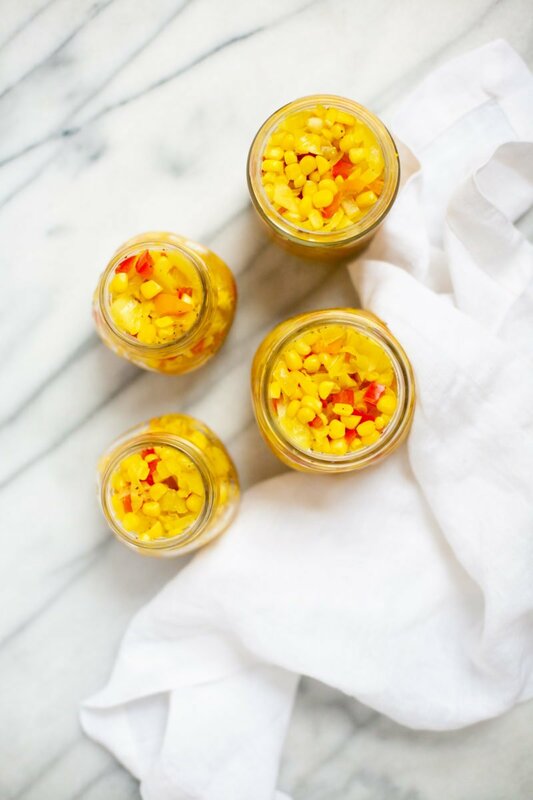 Yum, your corn relish looks delicious! I have yet to try “real” canning on my own, but I’ve done several batches of freezer jam with fresh, local berries/fruits. I think I would use the jars to can homemade salsa, as I love making it fresh and to my own taste! Plus we love salsa on just about anything! 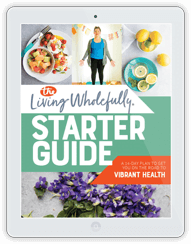 Love your blog and thanks for a great giveaway! I’d love to get into canning, but I also just love jars to use for storage and transporting. I blame Pinterest! To start canning, I’d probably do some peach jelly. My husband hates peaches, but I can’t get enough of them in the summer. It would be great to have some of that taste to hold onto through the cold winter. Though your relish looks delicious, the first thing I’d can would be strawberry jam. Nothing screams summer in a jar more to me! I would love to make some blueberry jam or maybe even fig preserves since I have lots of figs coming in on my fig tree. Oh man. That’s actually a good question. I’m a complete novice in the canning realm, though Hubster’s family has a long tradition of canning so I’m sure I could get some help. If it were still rhubarb season, I’d whip up some jam and go with that. Since it’s not, I’d be more apt to pickle some green beans for winter bloody marys. I’m from Georgia so we pickle anything that will sit still long enough. My favorite is pickled okra but squash, green tomatoes, green beans, and peaches are tasty too. The only one I don’t like is sweet watermelon rind pickles. Ummm, I would DEFINITELY make that corn relish. I too hail from Indiana (Bloomington!) and would take advantage of the delicious corn from our farmers market. Thanks so much for the recipe and the giveaway! It’s a toss up to me between pickles and tomatoes. I love pickles, but winter tomatoes have nothing on fresh summer tomatoes! We’re growing lots of peppers and tomatoes this year, so I’ll be canning some salsa this summer! I would can peaches! My favorite summer activity is picking fresh New Jersey peaches. I always come home with 10 pounds more than I can eat! I’d love to can them and enjoy them year-round. I’ve been doing a bunch of reading on canning and preserving lately, so this is perfect! The first thing I’d try would be pickled beets. I loved eating the ones my grandfather would make each Easter. I would make more fresh berry jam! Oregon is overflowing with boysens, marionberries, blackberries and strawberries at this time of year! We don’t get fresh corn here (otherwise I would be all over this recipe), but we have lots of fresh fruits and tomatoes that I am dying to try and can. Maybe I need to get over my canning fear. LOVE Ball jars and I am actually drinking my water from one right now. As for canning though I would definitely make pickled brussel sprouts…so yum! Giardinera I love it and Pickles of course. The house we bought this winter has 3 apple trees full of apples this year. I’d love to try canning some apples to mike pies this winter. I can’t tell whether the giveaway is open for international readers as well – but if it is, I’m definitely participating! I have never done much in the way of preserving things before – neither vegetables, nor fruit. However, if I were lucky enough to win the jars, I think my first batch would be peaches or nectarines in some sort of vanilla syrup. 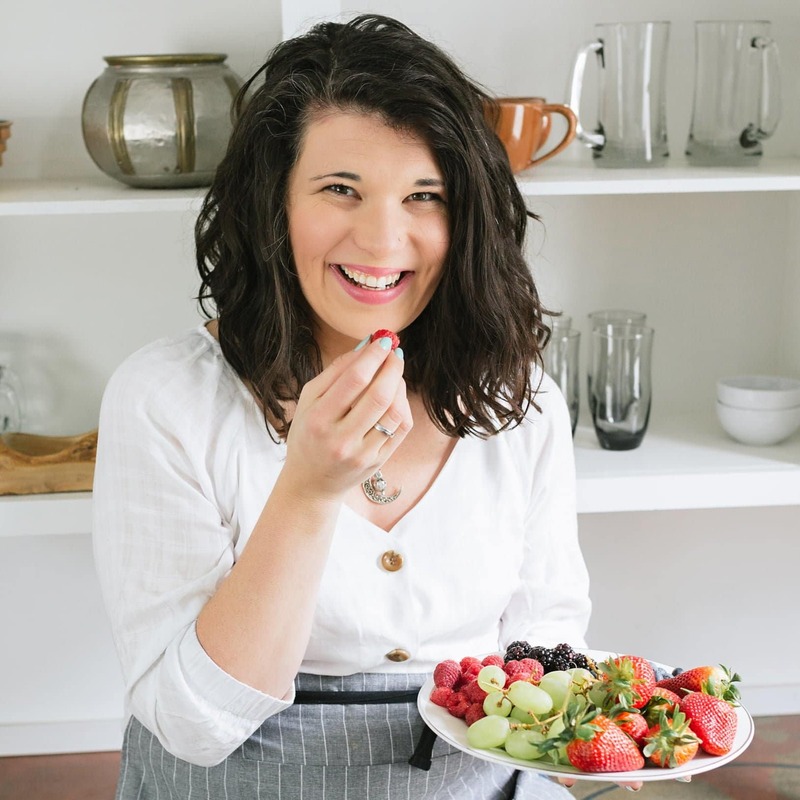 I am very heavily into nectarines at the moment, so it would be awesome to be able to preserve some of that goodness for the coming months as well! I just started a little nut butter company and we sell all of our nut butters and jams at local farmers markets. All of our products are stored and sold in ball jars! 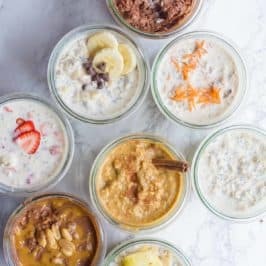 Have never canned anything before so I would take your word for how easy it is and do your recipe! LOVE your blog, by the way. I’ll probably make some sort of jam or relish. It really just depends on what’s available at the farmer’s market. If all else fails, we’ll make apple pumpkin butter. Super easy and very delicious. You can too! Oh. My. Heart. I super like you again… it must be those Indiana roots. I’ve been canning cherry juice, cherry jelly, and cherry syrup – oh yum. If I won something from Ball though (I did go to Ball State my freshman year, so I am a total Ball snob!) I would can beans. I’ve been trying to perfect pressure canning dried beans. I love how they’ve been turning out but the different beans need different amount of water in my opinion and I haven’t gotten all that worked out. Do you pressure can? I just tried it this spring and am in love! My husband just pulled three monster cucumbers out of the garden today (our first attempt at a garden! ), so I would love to make some pickles in these jars! I’d want to make a low sugar strawberry jam! Hi! I’d can jams and tomatoes. Thanks! I would can pickles! Homemade pickles are the best ever. i would preserve some concord grape jelly. I would can some pickles. My fiance and I are obsessed with pickles and I really want to try my hand at making my own. Thank you for posting this recipe! I was bored today and after I saw this, I decided to make it! It turned out great! I am still new to canning but I think my next project will be tomato jam. YUM! My grandmother used to can all sorts of yummy garden goodness. I can’t wait to learn to can and duplicate her pickle recipe or pickled egg recipe. I have never tried preserving anything before but I’ve always wanted to try it. 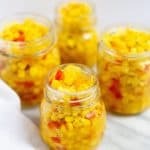 I am pretty sure I would try your recipe for corn relish, it sounds amazing and an easy one to try for the first time! I would definitely can some homemade jam or preserves. I really want to learn to make pickles! Dill pickles, sweet pickles, bread and butter.. I love pickles so much. 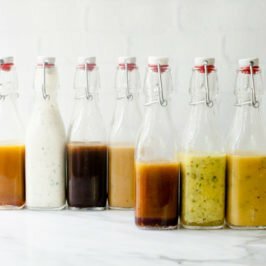 We always have so much corn that we have to freeze due to family bringing it down from Kentucky when they visit, so definitely some corn recipes (including the one you posted). And pickles! Peaches are finally in season here so I would make some peach jam. Thanks for the relish recipe. I had some candied jalapenos that my friend had canned a few months ago that were delicious! i think i would definitely start out with those. I would like to try this corn relish recipe and I’d probably give a try at some preserves. I would use my jars to can half a dozen jars of hot dilly beans, and the other half would be for pickled okra. Preserved summer in a jar. I’ve never preserved anything before but, if I were to start, it would be blueberry/jalapeno jelly. for sure. Man, there’s lots of yummy things to can! 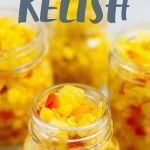 I’d love to try your Homestyle Canned Corn Relish recipe! I would also try to can some tomatoes or salsa! I would make cumquat marmalade – yum! Your canning jars would be put to very good use. I would can dandelion hazelnut jelly. I just have two bags of frozen spring dandelion flowers in my frezer right now waiting to be use. This jelly is soooo good it taste like sun shine warmed with the good taste of hazelnut. Yummy!